After 13 years, Lionni's classic tale of adventure, individuality, and friendship is available again. 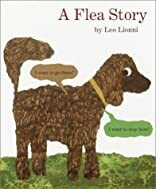 Told entirely in dialogue through speech balloons, here is the clever fable of two talkative fleas, who hop unseen from a dog's back to a porcupine's quills to a crow's wings. Arguing all the way, they finally agree that each flea should live his life the way he sees fit. Full color.